The alluring pink scoops of my Frozen Strawberry Lemon Yogurt may win the heart of your Valentine. This light and refreshing dessert is easy to prepare, naturally sweet and contains only four ingredients. The key to a simple and delicious recipe is to use good quality fresh ingredients. I happen to have lots of fresh strawberries from the Carralitos Farmers Market given to me by an ultra runner friend who came over last weekend to watch the Super Bowl. Knowing I would not be able to consume all those fresh strawberries before they perished, I decided to freeze most of them. Since my friend ran a 100K the day before delivering the strawberries, I felt it was only appropriate to use them to make something special and healthy. Note: Standard supermarket lemons may be substituted however I recommend using Meyer lemons if you can find them. Meyer lemons are sweeter which helps to cut the tartness of the yogurt. Otherwise, you may want to add more honey when using other varieties of lemons. Freeze the ice cream container according to instructions. 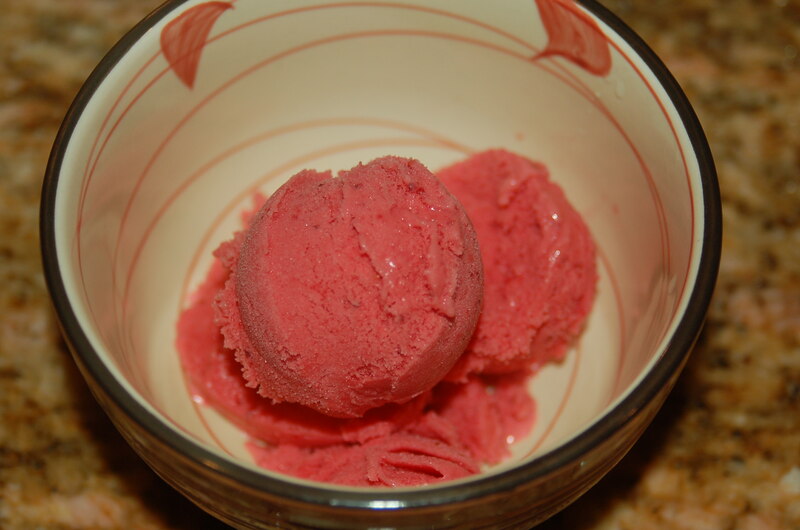 In a food processor or blender, puree the frozen strawberries. Add the Greek yogurt, lemon juice and honey. Continue to process or blend the strawberry mixture until all the ingredients are combined. Taste the yogurt. If you find it too tart, you can add more honey or lemon. Pour the mixture into an ice cream maker and use as instructed. It should take only 15 minutes or less for the yogurt to start to freeze up. Transfer into freezer container and freeze for at least 1 hour. Scoop out and add a fresh sprig of mint if you like. Alternatively, this Strawberry Lemon Yogurt can be poured into popsicle molds and enjoyed frozen on a stick.